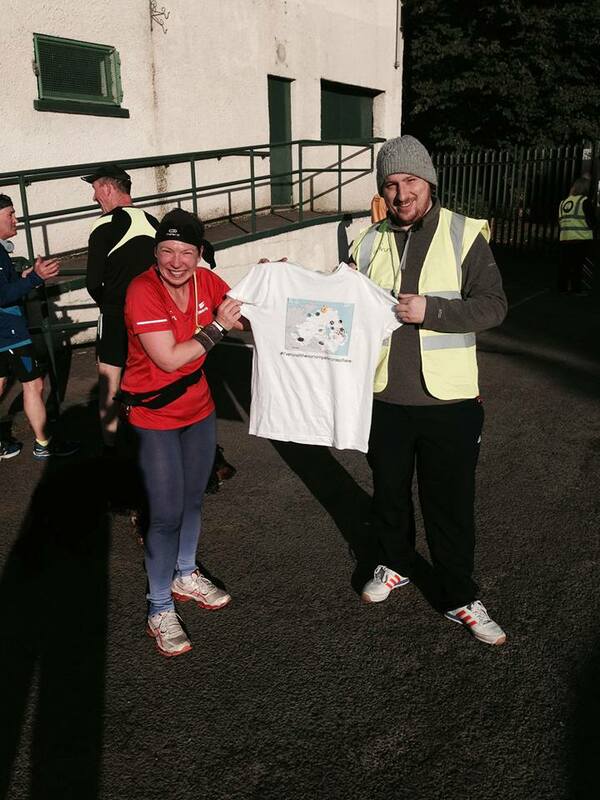 Having completed the set of NI parkruns, my plan is to get to the inaugural runs of any new ones that start up. 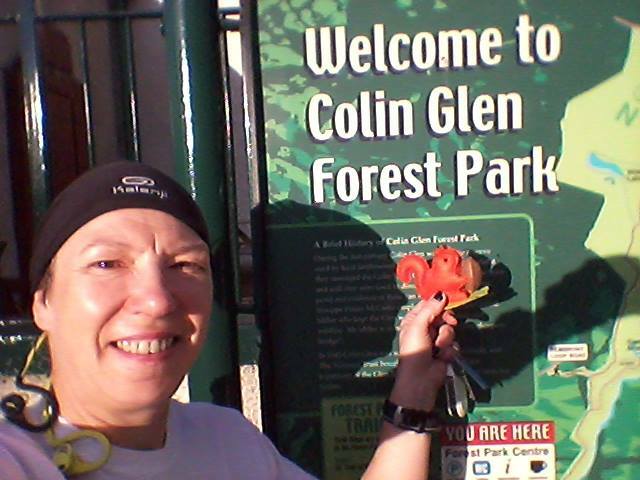 However I missed run number 1 of Colin Glen, in south West Belfast, because it co-incided with my 100th parkrun. And there was no way I was doing that one at anything other than dear old Wallace! But I did make sure I was at Event Number 2, on a beautifully crisp clear October day. Coming from Lisburn, it was a short hop on the M1, up Kennedy Way, turn left at the roundabout, and it’s under 2 miles up the road. I still managed to miss the actual car park entrance! There are 46 car park places, and a visitor centre with loos. The big numbers had been there the week before for the first one, and my visit was on the day of the GR8 Dundrum run, a popular event which many of my Jog Lisburn stable mates were attending. 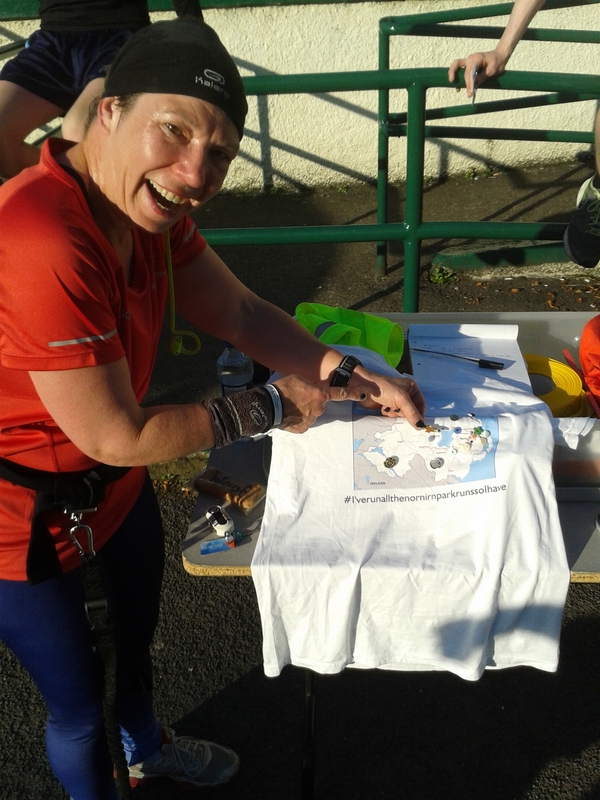 So the turnout was under 50, but there was a fantastic bunch of enthusiastic marshals and volunteers, and the other runners I was chatting to beforehand were all very welcoming – Minnie was as usual the centre of attention, despite her barkiness! The course is described as “challenging”, and I was a bit worried about the hills. 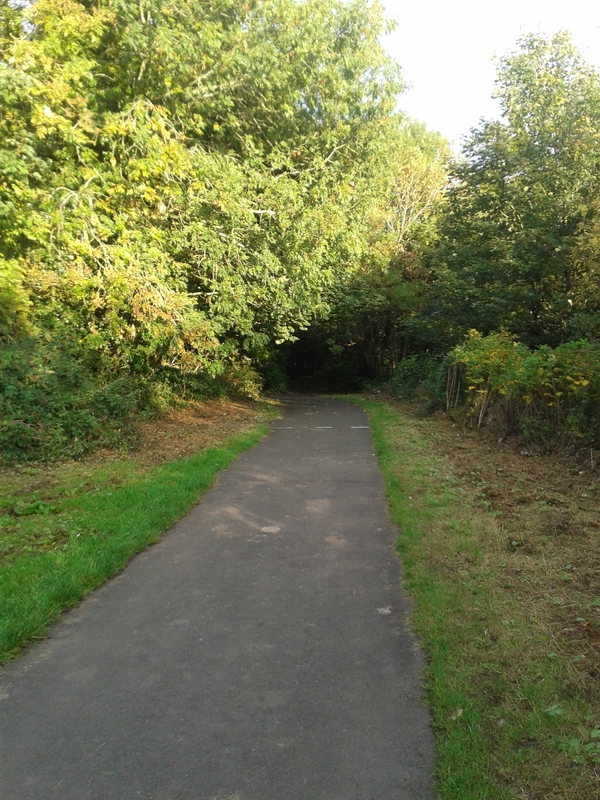 It starts not far from the car park, and follows a good tarmac path on an undulating route through some beautiful trees, streams and bridges. Yes there are hills, but they’re fairly short, and there’s a bit of a downhill after each one to recover. At the lake, it’s 2 laps around, and then a more gentle downhill homeward stretch. The final funnel is back at the car-park. 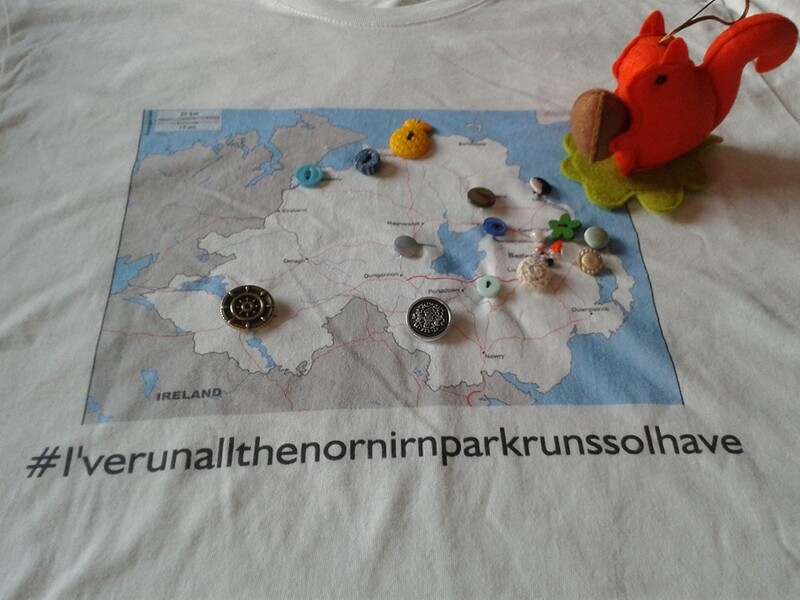 I’d made a T-shirt with a map of NI, and had sewn buttons at the location of each of the parkruns. I had fun choosing suitable buttons for some of the places – I particularly like the pineapple for the “Surfs Up” Portrush dudes. I had to use little beads for all the closely packed Belfast runs, and I’ll pick out a nice new bead for Colin Glen. Given all those hills, The Kooks and “Higher Ground” was certainly a suitable theme tune! I wore my Asics trainers, with Twinskin socks, which I now swear by. Trousers with zippy-pocket for my phone, Garmin, cordless earphones and wrist-sweatband. My barcode is on a plastic wristband, and I wore my red 50 shirt as I need to get as much wear out of it as I can before my 100 one arrives! Cracker, my lucky squirrel mascot now comes to all parkruns with me. We were overtaken by a few runners in the final km, but they were all male. And I skipped across the finish line in 25.30, scooping the age category record, best overall position of 10, and was 3rd in terms of age-grading percentage! First Female! Never in my wildest dreams…(well, OK, in my most wishful thinkingest of moments I fantasised about this), but I never actually imagined that one day it would come true! 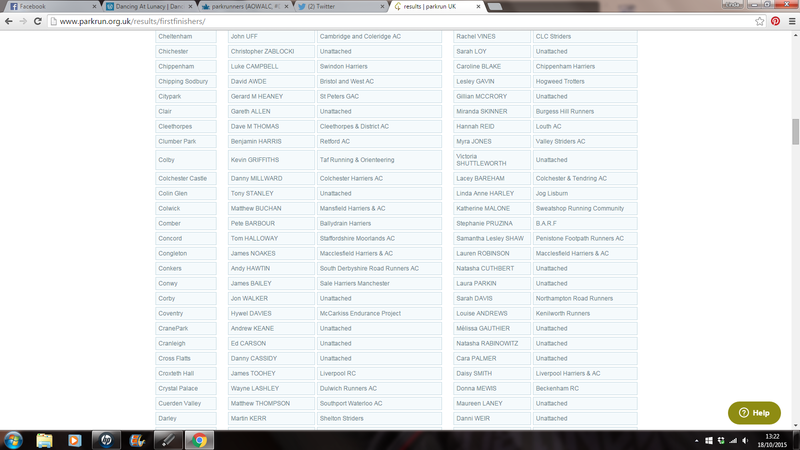 And the really cool thing is that my name will be forever etched in the event history pages. I’ve held age-category records before – at Valley and Comber – but they’ve since been beaten. Minnie of course got a special reward, bought from Murphys Barkery at last week’s Waggy Races: I really couldn’t have done this without her. In dancing news, this week of fabulous firsts also saw my daughter performing for the first time as a p’feshnull dancer. 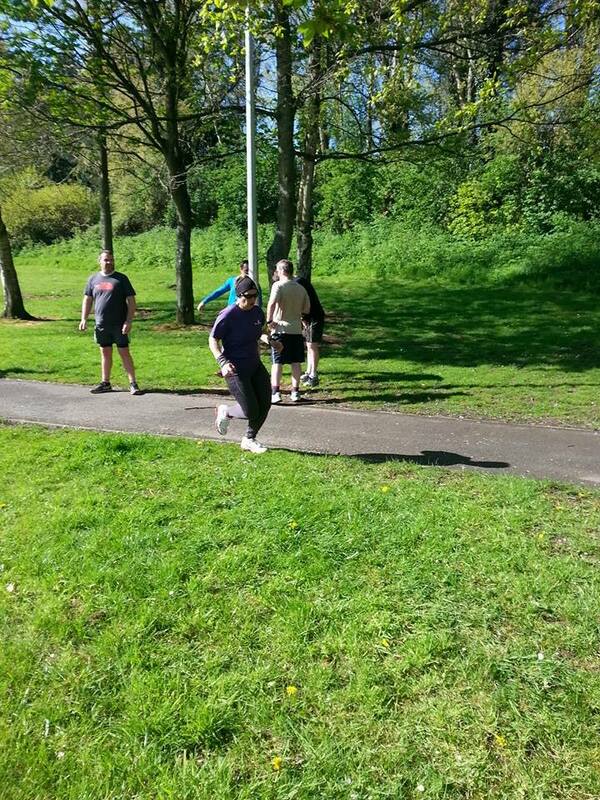 I’m off to Manchester next week to see her – so you have 3 guesses as to the location of next week’s parkrun! 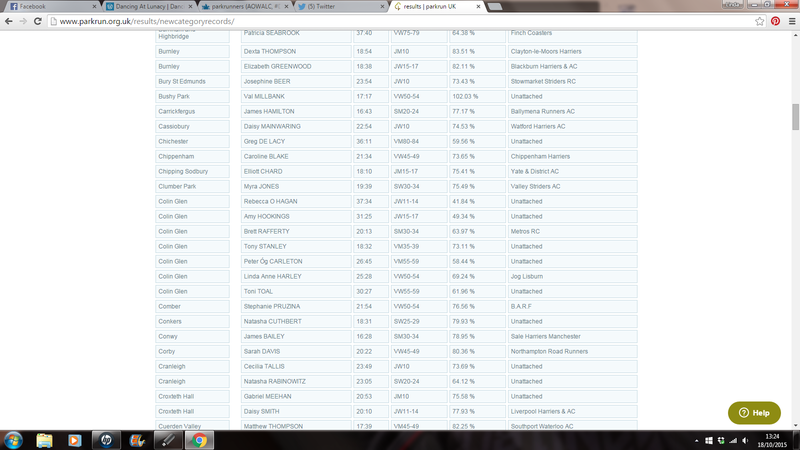 List of all the parkruns I’ve completed.